In this year's report, the Cherokee Preservation Foundation focuses on some of the investments the Foundation has made in youth on the Qualla Boundary and the surrounding region. In total, Cherokee Preservation Foundation's youth investments are valued at more than $9.25 million. 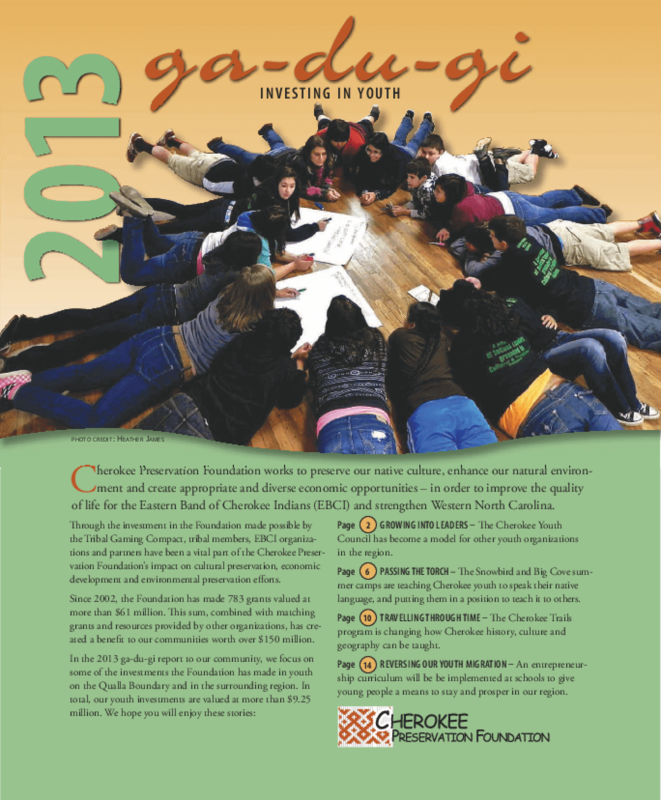 The 2013 report examines the Cherokee Youth Council and how it has served as a model for other youth councils in the seven westernmost counties, summer culture and language camps in the communities of the Eastern Band of Cherokee Indians, the Cherokee Trails program that is changing how the history of the Cherokee can be taught, and an entrepreneurship curriculum being implemented in the region's schools to give young people a means to stay and prosper in Western North Carolina. Copyright 2013 Cherokee Preservation Foundation.